SSK = Slip two stitches together knitwise, return to the left had needle in their new twisted position and knit 2 tog. This may also be worked as slip 1, knit 1, pass the slipped stitch over the stitch just worked. Using M., cast on 52 stitches. Work in rib of K1, P1 for 2 inches. Join in C. and work 35 sts. from 3rd to 8th row of Chart, working remaining sts. in stocking stitch in M.
9th row: Work 35 sts. from Chart, inc. once in next st., K2, inc. once in next st., knit to end of row. Work next 3 rows in patt. without shaping. 13th row: Work 35 sts. from Chart, inc. once in next st., K4, inc. once in next st., knit to end of row. Work 3 rows in patt. without shaping. Continue in patt. from Chart, working thumb and palm in stocking stitch and inc. as before in next and every following 4th row until there are 74 sts. on needle. Work 5 rows in patt. without shaping. Next row: Work 53 sts. in patt., turn. Next row: K1, P17, turn, cast on 4 sts. Using M. only, work 2½ ins. in stocking stitch on these 22 sts., ending with a purl row. 1st row: K4, K2tog, SSK, K6, K2tog, SSK, K4. 2nd row: K1, P16, K1. 3rd row: K3, K2tog, SSK, K4, K2tog, SSK, K3. Break off wool, run end through remaining sts., draw up and fasten off securely. With right side of work facing knit up 4 sts. from 4 cast-on sts. at base of thumb, knit across sts. which were left. Work 17 rows in patt. 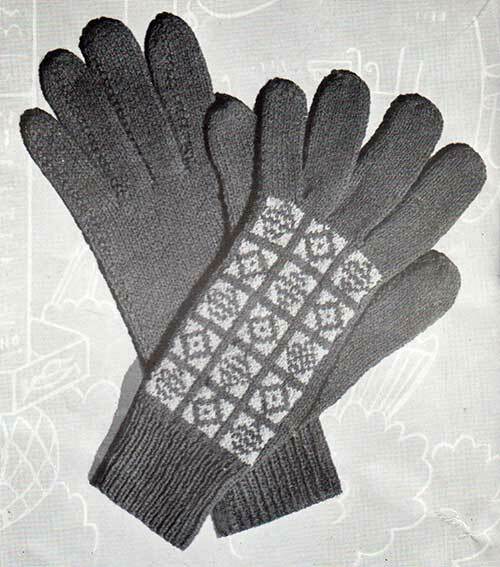 from Chart and stocking stitch for palm. Next row: Break off C., K4, (K2tog, K3) six times, K7, turn. Next row: K1, P15, turn, cast on 4 sts. Work 2¾ ins. in stocking stitch on these 20 sts. ending with a purl row. 1st row: K1, (SSK, K5, K2tog) twice, K1. 2nd row: K1, P14, K1. 3rd row: K1, (SSK, K3, K2tog) twice, K1. Finish off as given for Thumb. With right side of work facing, join in wool and knit up 4 sts. from 4 cast-on sts. at base of First Finger, K7 , turn. Next row: K1, P16, turn, cast on 3 sts. Work 3¼ in in stocking stitch on these 20 sts., ending with a purl row. Finish off as given for First Finger. With right side of work facing, join in wool and knit up 4 sts. from 3 cast-on sts. at base of Second Finger, K6, turn. Work on these 20 sts. as given for First Finger. With right side of work facing, join in wool and knit up 4 sts. from 4 cast-on sts. at base of Third Finger, K6. Next row: K1, P15, K1. Work 2½ ins. in stocking stitch on these 17 sts., ending with a purl row. 1st row: (K1, SSK, K3, K2tog) twice, K1. 2nd row: K1, P11, K1. 3rd row: (K1, SSK, K1, K2tog) twice, K1. Work exactly as given for Right Hand Glove until there are 60 sts. on needle. Work 2nd to 8th rows incl. from Chart, whilst at same time working 25 sts. in stocking stitch in M. at opposite end of needle. 9th row: K20, inc. once in next st., K2, inc. once in next st., work in patt. to end of row. 13th row: K20, inc. once in next st., K4, inc. once in next st., work in patt. to end of row. Continue in patt., inc. as before in next and every following 4th row until there are 74 sts. on needle. Next row: Work 39 sts. in patt., turn, cast on 4 sts. Next row: K1, P20, K1, turn. Work on these 22sts as given for Thumb of Right Hand Glove. With right side of work facing and using M., knit up 4 sts. from 4 cast-on sts at base of Thumb, work across remaining sts. from Chart. Work 16 rows in patt from Chart and stocking stitch for palm. Break off C.
Next row:P4, (P2tog, P3) six times, purl to end of row. Next row: K35, turn, cast on 4 sts. Next row: K1, P18, K1, turn. Work on these sts as given for First Finger of Right Hand Glove. With right side of work facing, knit up 4 sts. from 4 cast-on sts. at base of First Finger, K6, turn, cast on 3 ts. Next row: K1, P18, K1. Work on thee 20 sts as given for Second Finger of Right Hand Glove. With right side of work facing, knit up 4 sts from 3 cast-on sts. at base of Second Finger, K6, turn, cast on 4 sts. Work on these 20 sts. as given for First Finger of Right H and Glove. With right side of work facing, knit up 4 sts. from 4 cast-on sts. at base of Third Finger, K7. Work on these 17 sts. as given for Fourth Finger of Right H and Glove. With a lightly damp cloth and warm iron, press lightly. Using a flat seam, sew up thumb, finger and side seams. Finally, press lightly. 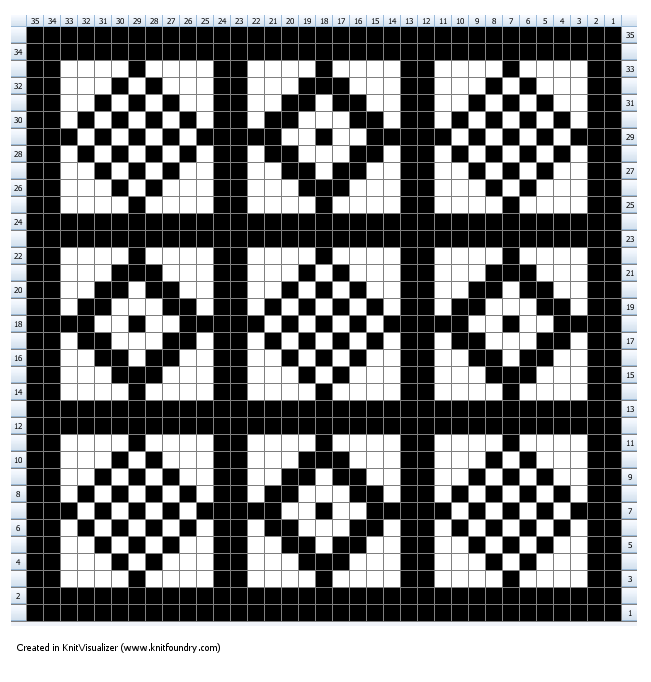 The original publication of this pattern is in the public domain, however, the updated text and all charts in this version are copyright Sarah Bradberry, May 26th, 2013. All rights reserved.